I bet you are wondering how this could be possible. Rice? That's a big Bandster no no. 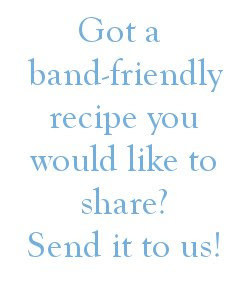 Believe it or not, it is band-friendly! Cauliflower is easy to grate since it is so firm. but you could also use your food processor if it will grate. 1/2 a head of grated cauliflower gave me enough "rice" for 2-3 bandster servings. First, Cook chicken. This is great way to use left overs. I marinaded my chicken with a store bought Terriyaki marinaded then I pan "fried" in the juices. It was a little tougher than I would have preferred. Next time, I will pull out my little crockpot to cook the chicken. Put a couple tablespoons oil in the bottom of your pan and heat. Once heated, add garlic and then grated cauliflower. Add green onions, soy sauce, and other veggies. Stir well. Move mixture to one side of pan. With the empty side, crack open eggs and scramble. Once cooked, mix with "rice". Add chicken and serve. Makes 3 bandster portions with 270 calories and 25 grams of protein per serving. The Taste: The texture of the cauliflower is so similar to rice. It is a little bit more moist than rice. I have found that when you eat it with a sauce you can barely tell the difference. Maybe it is just me because I haven't had rice in so long. My husband really enjoys it. I think it is a really great substitution for rice.